1990: 92-94-93 = 279 points (12th). 1989: 89-95-94 = 278 points (11th). 98-96-94 = 288 points (1st). 01/05/1991: 98-98-94 = 290 points. 01/11/1991: 97-94-97 = 288 points. 22/10/1989: 100-97-100 = 297 points. Overall Build: Powerful; thick fur; chest markings still obvious; correct skull, sufficient underjaw; eyes medium-brown; firm back with very good croup; very good chest width and depth, good front and sufficient rear angulation; free gaiting with very good firmness in back and ligaments. Nature: Spirited, open and sure. Very high protective instinct and fighting spirit, high courage and hardness with middle sharpness. Note: No limitation for breeding. Castor von der Mooreiche passed the Körung 'for life' with highest possible rating for working drives and competed twice in the D.V. Meisterschaft. He was also International + German Show Champion and DV + VDH Sieger. His sire, Ali von Langenhorst, passed the Körung 'for life' with highest rating for hardness and working drives plus winner of numerous show titles. Castor's maternal grand-sire, Bingo von Ellendonk, was the winner of the D.V. Meisterschaft in 1977 and passed the Körung 'for life' with highest rating for hardness and working drives. Castor lived to 8 years of age while his sire, Ali von Langenhorst, lived to 16 years of age. Cheska: SchH 3 and dam of the vom Merkureck “A” litter (Adux, Andy, Anouk). 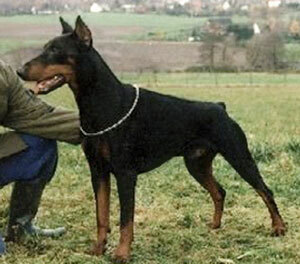 Badges: SchH 3 and sire of the von der Mooreiche “Y” litter (Yoker). Baccira: SchH 3 and passed the Körung 'for life' with Körklasse 2A rating. She is dam of the vom Heiligenwald “A, B, C, E” litters (Chircana, Elroy). Bora: SchH 3, DV-DM participant (placed fifth in 1997). Britta: SchH 3, FH and passed the Körung 'for life' with Körklasse 1A rating. She is dam of the von der Karlsbergquelle “A, B” litters (Amigo). Freia: SchH 3, FH, DV-DM Vice-Leistungssieger and passed the Körung 'for life' with highest possible ratings for hardness, courage and working drives. She is dam of the vom Seevetal “A, B, F” litters. Quanto: IPO 3, IDC-WM participant. Queen: IPO 3, IDC-WM Leistungssiege and IDC-DM Vice-Leistungssieger in 1995.